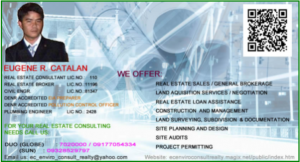 Bacolod Property Specialist, its a Real Estate Broker Company in Bacolod City. We sell and feature the front runners in subdivision development in Bacolod City, the Most Livable Highly Urbanized Center in the Philippines, from High-end Subdivision Development to Socialized and Economic Housing Developments.High-end subdivisions Includes, Ayala Land Premiers; “The North Point”, “North Point Enclaves”, “Plantazionne” and “Verdana Homes Asyana”. MegaWorld’s “Forbes Hill” and Suntrust “Fountain Grove”, Robinsons Land’s Brighton Community, Camela Homes of Vista Land, Avida Village North Point by Avida Land, the Amaia Lands Project; Amaia Scapes North Point and Fil-Invest “Palm Estate Futura Homes”.